The United States Department of Agriculture Food Safety & Inspection Service has issued recommendations to those states that have been affected by the recent powerful storms that have hit the country. Residents who are in Arkansas, Oklahoma, Indiana, Missouri, Mississippi and all other parts of the Midwest are advised to follow these recommendations in order to minimize the possibility for foodborne diseases caused by problems associated with the powerful storms such as flooding and power outages. According to Al Almanza, Administrator for FSIS, food safety can become a critical risk to public health if flood waters increase. In fact, food safety is one of the factors to be considered in any form of emergency. Almanza added that the public should be aware that information is always readily available regarding how to protect their supply of food in case of calamities. Appliance Thermometer – This should be placed inside the refrigerator as well as the freezer. This will help you monitor the food temperature of your refrigerated foods and thus help you determine if the food is already possibly unsafe. Temperature – Always check that freezer temperature is at least 0o F or lower. Also, refrigerator temperature should at least be 40o F or lower. Ice – Always have ice available inside the freezer to help keep the food cold in case of a power outage. Freeze food items that are not consumed immediately in order to keep them at a safe food temperature for a longer time. 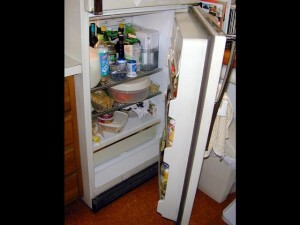 Placement of Food – Place food on refrigerator shelves that will ensure that floodwaters will be unable to reach them. If you have even a single doubt that food may have been contaminated or is already spoiled, throw it out.